The entryway. I would love to have the stockings by the fireplace, but little hands are iffy. I just don’t trust stocking holdings and a toddler yet 😉 But they fit perfectly on our railing off of the entryway! I bought Michael and myself basic stockings and wrote our names on with gold glitter our first year together, and they just stuck for me. These stockings were like $2 a piece, but I kind of love them. Maybe one day when I know the family is 100% complete I will buy some fancier ones, but I kind of love handwriting the names on my babies stockings. This was the entryway originally. That snowman was affectionately named ‘Daddy Snowman’ by Jackson, and is now resting peacefully in the garbage after taking a little bit too much abuse from Jackson 🙁 Poor boy has been walking around whimpering ‘Daddy Snowman’ ever since we tossed him. I actually just bought a replacement that is slightly less breakable so hopefully that does the trick! I knew I needed the pillow with the first letter of our last name the second I saw it. I am also obsessed with our plaid throw. Ok so my parents dropped the ball on Elf on the Shelf. We had three elves that moved and got into trouble while we were sleeping as kids before it was even a ‘thing’. So instead of getting the mainstream elf, I went online and found an identical copy of the ones my parents have. It is so special to me to carry on the ‘original elves’ that I grew up with! I am obsessed with these mugs from Hobby Lobby! They have an entire matching dinnerware set actually..I am debating going back for the rest! The candy cane holder is passed onto me from my mom. I love having little pieces from my childhood! I love having a fun candy dish in the kitchen. Especially now that I can fill it with all the fun Christmas themed treats! The view from upstairs. All the heart eyes! I will never grow tired of how cozy our living room is at Christmas time. And one more view, because I can’t get enough! Linking up with Lindsay and Andrea for holiday home tours today! I love all your decorations! Your tree is BEAUTIFUL! I wish we had vaulted ceilings because tall trees are my favorite! Mackensey!!!! Everything is so beautiful! I am SO jealous of your giant tree!! I seriously want to build another house just so we can have two story ceilings in the living room. And I think your mantle is my very favorite part… that buffalo plaid banner is so stinking cute. And how cool that your parents did the elves for you guys when you were little before it was even mainstream! That is so neat that you found one that looked like your old ones! Thank you so much for linking up! I loved seeing your home decorated so beautifully. I know you guys will enjoy your first Christmas in your new house! Your tree is so perfect! And the countdown house is adorable! Christmas decorations make a home so cozy! And it's always fun to decorate a new home! Your mantle is awesome!! Love the idea of hanging the stockings on the stairs.. totally festive and makes sense with the kiddos! And you have the Winter candle burning… my absolute favorite!! Thank you! Yes it is so huge. It is kind of funny, now that we have this huge tree, 'normal' trees when we got to other homes seem so small! We quickly forget just how massive it is. Thank you! Two story ceilings were a must on my list when we decided to build our house, I love the space it gives us! I must admit though, it makes decorating the walls a bit more challenging! Thank you! I love our countdown house, Jackson loves opening the doors every day so much! Don't they!? All of the twinkly lights and the fireplace going..I wish it could be like that all year round! Thank you! Eventually we plan to get the TV on the wall and off of the mantle, so we can have even more space for décor, I can't wait! 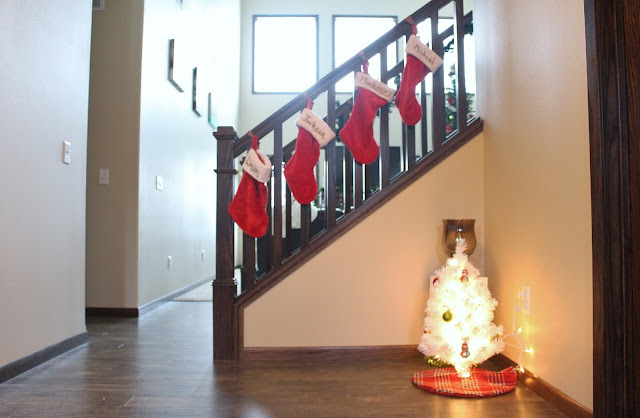 I actually really like the stockings on the stairs, it is added décor to another space, as the mantle already has plenty going on and really looks fine without stockings. YESSS the winter candle smells so yummy! That and Fresh Balsam are all I have going these days! I do love your countdown house! And everything is so pretty. I need to do more with my own domain! For sure. Very inspiring! Your tree is beautiful! How tall is it?! I LOVE your massive tree. You can really see how big it is when you take the photo from upstairs. Love seeing all the decorations in your new house. It is so beautiful!